The Gluten Free Nomad brings you the latest additions to my treasury of Traditional Foods from Around the World that are Gluten Free, as well as information and stories from readers like you. Happy New Year, and welcome to the first issue of The Gluten Free Nomad, where you'll learn what's new at Gluten-Free-Around-The-World.com. There's a lot that's new, but before I get to that, I know you may be waiting for the Free Ebook of Easy Gluten Free Recipes I promised. Click here if you haven't subscribed yet and would like to get the eBook. If you are already subscribed, the eBook is now available for download, and instructions are at the bottom of this newsletter. Note: If the links below don't work, copy and paste them into your browser. #1) I've added a customized forum to the site. It's a place to go to share your gluten free stories, symptoms, and ask questions. Have you been diagnosed with Celiac Disease? What are / were your symptoms? What's your favorite restaurant with a gluten free menu, or completely gluten free restaurant? #2) I also added a special Recipe Exchange section for sharing recipes, organized by area. I hope you will bookmark it and visit often. And please share your favorite traditional recipe if you have one. Maybe something handed down from your grandmother? Or a discovery you made while traveling would be great to hear about. The more we exchange, the easier gluten free life will be for all of us. I compared two popular brands of blanched almond flour by sifting down a pound of each to various particle sizes. You will be amazed at the difference. See why one type of flour is not necessarily better than the other. Read about almond meal vs almond flour here. including almond flour recipes, some South American recipes, and a page about almond macaroons. Click here for some great almond flour recipes. Do you know of any great websites or blogs that would be good partners for Gluten Free Around The World? I could really use the support of other websites or blogs linking to the site, so just reply to this newsletter if you have any suggestions or contacts of sites you know will link to GFATW and be complementary for us and for you, as a gluten free consumer. You can also give us a shout out on Facebook, Twitter or any other way...every little bit helps Gluten Free Around The World grow and be able to continue to provide you with the great gluten free ideas and recipes. If you have your own blog and try any of our recipes, or find any information helpful, I hope you will blog about it and link to us. Thank you very much for taking an extra moment to consider this request! Be sure to let them know that subscribing is free. New subscribers will receive their own custom download link when they confirm their subscription. Right-click the following link (option click on a Mac) and it should download automatically. If that doesn't work, click it to view in your browser, and then click save a copy. And don't worry, if the heading or font looks screwy in your browser, it should look fine when saved to your computer. 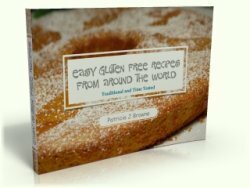 Download Your Easy Gluten Free Recipes eBook Here. Problems? Just hit reply and let me know. If you have comments on the easy gluten free eBook please leave them here, so others may be encouraged to check it out.